MBTA: Located about four miles North of Boston, Everett can be accessed through the MBTA Bus Route 112 Wellington Station – Wood Island Station. 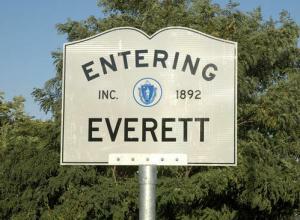 Originally part of Charlestown then Malden, Everett became its own city in 1870. The city was named after Edward Everett who served on the House of Representatives and Senate, as well as Minister to Great Britain and as the United States Secretary of State. In his abundant spare time, Everett also served as President of Harvard University. The Leavitt Corporation calls this great city home, manufacturing its trademark Teddie Peanut Butter there since 1924. A notable Everett-raised individual is actress Ellen Pompeo, more commonly known as Meredith from Grey’s Anatomy.